Genus Chendytes, the diving-geese. These birds became extinct in prehistoric times. They were large, goose-like ducks with reduced wings which were unfit for flying, but could assist in diving as in the Great Auk. At least one species survived to the Holocene. Law's Diving-goose Chendytes lawi : The Law's Diving-goose was a goose-sized flightless sea-duck, once common on the California coast, California Channel Islands, and possibly southern Oregon. It lived in the Pleistocene and survived into the Holocene. It appears to have gone extinct about 1800 BC. Its remains have been found in fossil deposits and in early archeological sites. It was probably driven to extinction by hunting and loss of habitat. Genus Somateria, the eiders. These are large marine ducks The drakes have body plumage showing varying amounts of black and white, and distinctive head patterns. Females are brown. Genus Melanitta, the scoters. These are stocky marine ducks. The drakes are mostly black and have swollen bills. Females are brown. 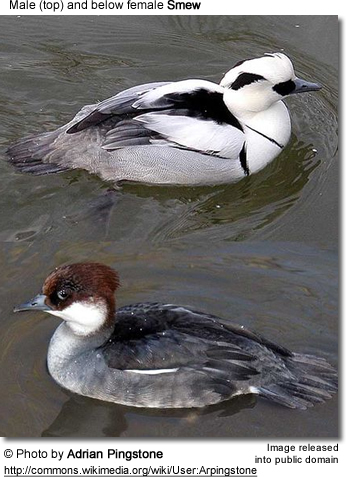 Genus Bucephala, the goldeneyes. These are less marine than some species in this group, and will winter on fresh water. 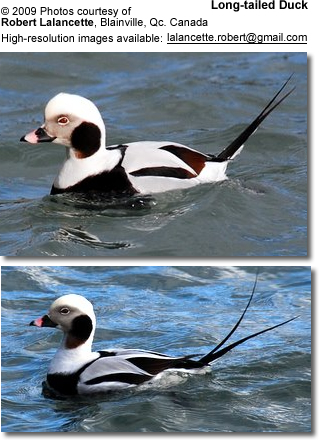 Drakes have white bodies with black backs and distinctive head markings. Females are grey with chestnut heads. 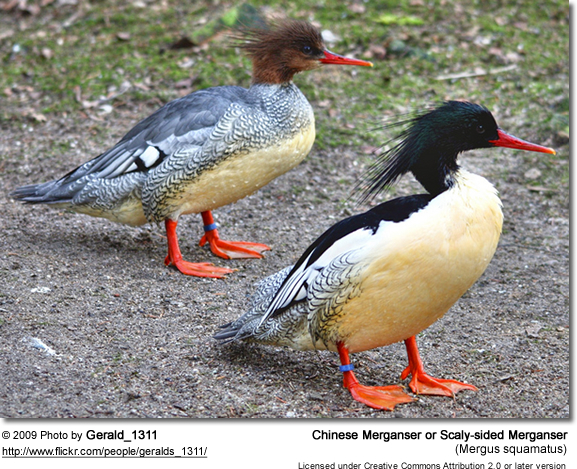 Genus Mergus, the typical mergansers. These are the least marine of this group, only Red-breasted being common on the sea. These are large saw-billed ducks which dive for fish. 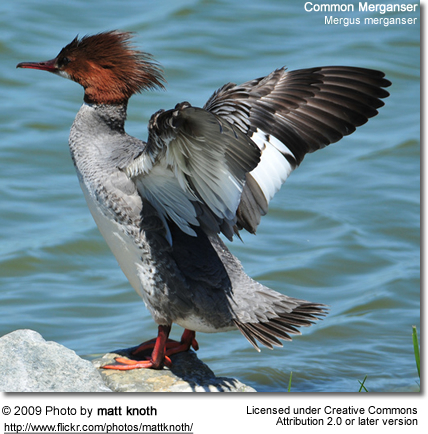 The fish-eating members of this group, such as the mergansers and Smew, have serrated edges to their bills to help them grip their prey. These are therefore often known as "sawbills". Other seaducks take mollusks or crustaceans from the sea floor. Many species have developed specialized salt glands to allow them to tolerate salt water.